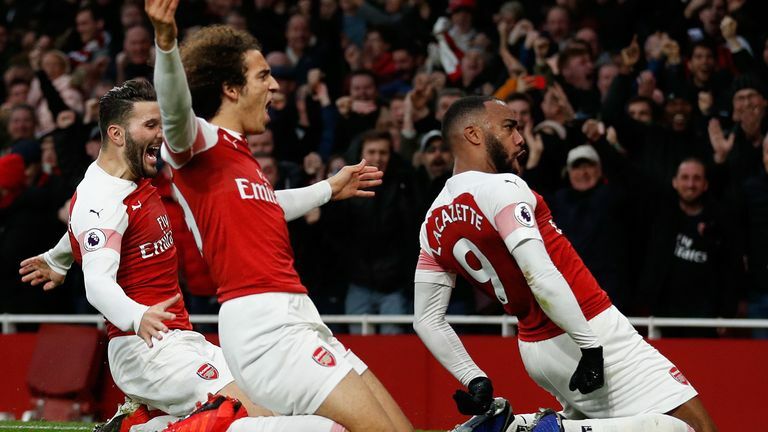 Arsenal saw off Tottenham in one of the games of the season with a pulsating 4-2 victory on Super Sunday at the Emirates. In a topsy-turvy north London derby, Arsenal dominated early on and took the lead through Pierre-Emerick Aubameyang's penalty (10), but were pegged back by Eric Dier's near-post header (30), which caused a ruckus after he celebrated in front of Arsenal fans. Spurs then stunned the Emirates as Harry Kane converted from the spot after Rob Holding foolishly left a leg in on Heung-min Son (34), but Arsenal were level after the break through Aubameyang's fine curling effort from the edge of the box (56). Eric Dier's celebrations caused some unsightly scenes on the sidelines as Tottenham and Arsenal players clashed. Sub Alexandre Lacazette put Arsenal 3-2 ahead with 15 minutes remaining, squeezing a shot into the corner from 20 yards via a deflection, and they added a fourth two minutes later through Lucas Torreira after he raced through on goal at an angle. Jan Vertonghen then saw red for a second yellow late on, and the result means Arsenal leapfrog their bitter rivals Spurs into fourth place in the Premier League table, eight points off leaders Manchester City. Arsenal looked explosive in the early stages, with Spurs harried inside their defensive third, and from an early corner they were awarded a penalty via Vertonghen's needless handball. Aubameyang duly converted, but the pressure did not stop there. Aubameyang could not get his body right as Sead Kolasinac found him six yards out, before Alex Iwobi forced Hugo Lloris into a low block with a first-time effort from 12 yards from another Kolasinac delivery. Spurs started to settle as Son forced two saves from Bernd Leno, and the visitors then got their leveller on the half hour as Dier swept in at the near post to squeeze home Christian Eriksen's free-kick from the left. 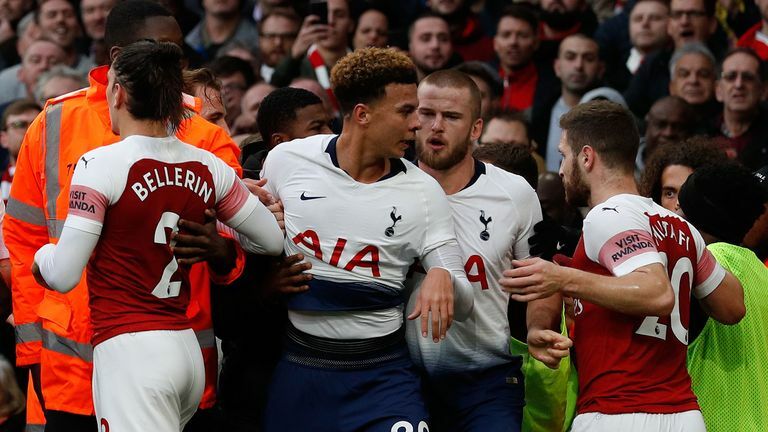 As Dier celebrated in front of the Arsenal fans, the home subs got involved, causing a melee between both sets of players, and prompting Spurs boss Mauricio Pochettino to run the length of the touchline in an attempt to calm the situation. The stunning turnaround was complete just four minutes later as Holding needlessly tripped Son on the left of the box; Kane converted, his eighth goal in a north London derby, meaning Arsenal still have not gone into half-time ahead this season. Lloris then superbly clawed away Shkodran Mustafi's looping header in first-half stoppage time, and half-time only provided a light breather as the drama continued. 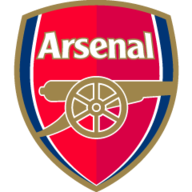 Arsenal brought on Lacazette and Aaron Ramsey, and it was the latter who played a part in the equaliser, slipping into the final third and feeding Aubameyang, who curled a stunner past the rooted Lloris from 20 yards. Unai Emery named the same starting the XI that faced Bournemouth last weekend, however, the big news was no Mesut Ozil in the matchday squad due to a back spasm. The only change from the Tottenham side that beat Chelsea last weekend saw Jan Vertonghen replace Toby Alderweireld in central defence. Dele Alli then blocked Mustafi's effort through a crowd off the line and Torreira blasted the rebound just wide, but Arsenal got the goal they deserved through Lacazette. 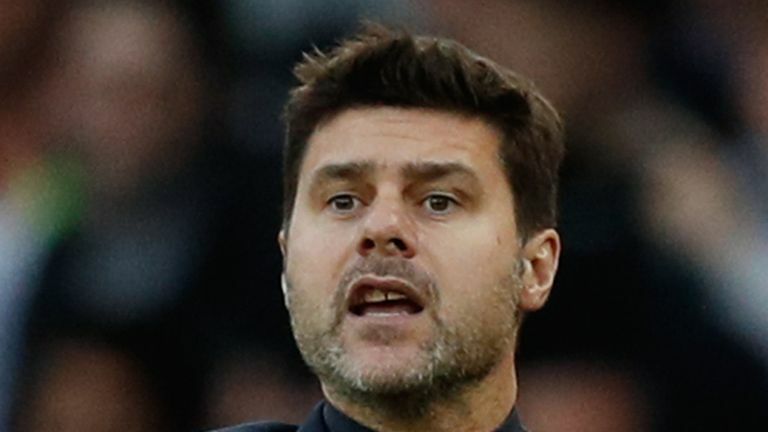 Juan Foyth needlessly gave the ball to Ramsey, who fed the Frenchman in the final third, and his shot from 20 yards deflected off Dier and squeezed past Lloris. The Emirates erupted moments later with their fourth; Aubameyang's through ball sent Torreira free at an angle on the right, and he duly found the far corner with a fine finish. "It's shaking. This stadium is shaking," said Sky Sports co-commentator Gary Neville. There was a final insult for Spurs in the closing moments as Vertonghen saw red for a second yellow, but Spurs were already floored as Arsenal remain unbeaten in 19 in all competitions. I've hated coming here in the last couple of years, in some ways, because there's been an apathy and an atmosphere that this great club doesn't deserve. Today it was completely different and it has shocked me. 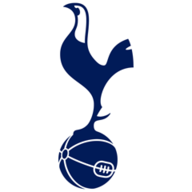 It has shocked me because Tottenham are a team I really admire and have loved watching over the last two or three years. Today they have been out-run. It was a collective display by Arsenal. There's still massive improvements to make in individual players and Unai Emery will definitely delve into the transfer market in the next two or three windows, but they have been absolutely sensational today. Unai Emery: "I think our process and today our supporters here, the atmosphere was very good and they push a lot for us. In a difficult first-half moment we keep the calm, and we said in the dressing room that we had good moments in the first half. "It's the reason every match is an important three points. For the supporters it is a special match, and for us to also because we want to give them a special match. I think they connected with the supporters today." Mauricio Pochettino: "They were so fresh because eight, nine players didn't play on Thursday and they were preparing the game. It is not an excuse but when you concede 3-2 in the second half, you need energy to come back." Torreira is becoming something of a fan favourite here, and his energy and dynamism in midfield pushed Spurs uncomfortably close to their penalty area in big stages at the Emirates. Tottenham's Harry Kane has scored eight Premier League goals in north London derbies - no player has scored more in the competition (level with Emmanuel Adebayor). Arsenal now go to Manchester United on Wednesday night in the Premier League, while Tottenham host Southampton, also on Wednesday night.